The Supreme Court of Kenya is established under Article 163 of the Constitution as the final arbiter and interpreter of the Constitution. The Court comprises of the Chief Justice, who is the President of the Court, the Deputy Chief Justice, who is the Vice-President of the Court and five other Judges. The Court has the exclusive original jurisdiction to hear and determine disputes relating to the elections to the office of President arising under Article 140 of the Constitution. (3) If the Supreme Court determines the election of the President- elect to be invalid, a fresh election shall be held within sixty days after the determination. The Court also has appellate jurisdiction to hear and determine appeals from the Court of Appeal and any other court or tribunal as prescribed by national legislation. As a matter of right where the case involves interpretation or application of the Constitution or a matter certified by the Supreme Court or the Court of Appeal as one that involves a matter of general public importance. The Supreme Court may review a certification by the Court of Appeal and either affirm, vary or overturn it. The Court can also render an advisory opinion at the request of the National Government, any State organ, or any County Government with respect to any matter concerning County Government. It can also determine the validity of a declaration of a state of emergency; an extension of such a declaration or any legislation enacted or action taken in consequence of a declaration of a state of emergency. 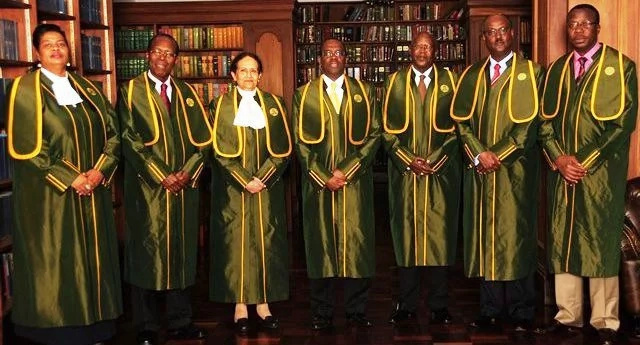 In 2013, the Supreme Court of Kenya arbitrated over its first ever Presidential petition where several parties challenged the election of President Uhuru Kenyatta and his deputy, William Ruto. The elections were indeed conducted in compliance with the Constitution and the law. That rejected votes ought not to have been included in calculating the final tallies in favor of each presidential candidate. The final judgment was issued on 16 April 2013. The court ruled that all members were to pay for their own costs.